WILMINGTON, N.C. — Gray muck is flowing into the Cape Fear River from the site of a dam breach at a Wilmington power plant where an old coal ash dump had been covered over by Florence’s floodwaters. Forecasters predicted the water will continue to rise Saturday at the L.V. Sutton Power Station. Duke Energy spokeswoman Paige Sheehan said the utility doesn’t believe the breach poses a significant threat of increased flooding to nearby communities. Sheehan said the company can’t rule out that ash might be escaping the flooded dump and flowing through the lake into the river. 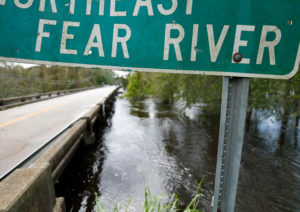 No environmental regulators were at the scene to help catalog the potential harm to the Cape Fear, with officials citing unsafe conditions. Mike Regan, secretary of the state Department of Environmental Quality, said Saturday that aerial video and photos of the site show “potential coal ash” flowing into the river. “When the environment is conducive, we will put people on the ground to verify the amount of potential coal ash that could have left and entered those flood waters,” Regan said. Floodwaters breached several points early Friday in the earthen dam at Sutton Lake, the plant’s 1,100-acre (445-hectare) reservoir. Lake water then flooded one of three large coal ash dumps lining the lakeshore. The ash left over when coal is burned to generate electricity contains mercury, lead, arsenic and other toxic heavy metals. Duke said Friday the plant’s inundated basin contains about 400,000 cubic yards (305,820 cubic meters) of ash. The area received more than 30 inches (75 centimeters) of rain from former Hurricane Florence, with the Cape Fear River still rising and expected to crest Sunday and remain at flood stage through early next week. Gray material the company characterized as “coal combustion byproducts” could be seen floating in the lake and river. Earthjustice, an environmental advocacy group with a boat in the river, provided The Associated Press with images Friday showing wide gray slicks in the water. A team member plucked a turtle from the muck and rinsed it off. Environmental Protection Agency regional administrator Trey Glenn said Friday his staff was monitoring the situation at Sutton from the state Emergency Operations Center in Raleigh, about 150 miles (240 kilometers) northwest of the Sutton plant. He said dozens of EPA staff were scattered throughout the region impacted by Florence, checking on toxic waste sites and oil storage facilities. He said EPA has offered to help North Carolina officials respond to the Sutton incident. “As of this evening, North Carolina has not requested additional support,” he said. With no regulators at the Sutton plant, it was left to Duke employees to collect water samples that would be tested in the company’s in-house lab. Environmental groups also collected samples from the river that would be sent to a private lab. Security personnel for Duke blocked access Friday to Sutton Lake Road, leading to a public dock on the reservoir, a popular boating and fishing site. Sutton Lake is the former cooling pond for a coal-fired plant Duke retired in 2013 and replaced with a new generating station running off natural gas. Duke said that power plant was shut down overnight and all employees safely evacuated. The breach at the Wilmington site is separate from last weekend’s reported rupture at a nearby coal ash landfill, which spilled enough material to fill 180 dump trucks. Duke’s ash waste management has faced intense scrutiny since a drainage pipe collapsed under a waste pit at an old plant in Eden in 2014, triggering a massive spill that coated miles (kilometers) of the Dan River in gray sludge. The utility later agreed to plead guilty to nine Clean Water Act violations and pay $102 million in fines and restitution for illegally discharging pollution from ash dumps at five North Carolina power plants. It plans to close all its ash dumps by 2029. At the separate Duke plant near Goldsboro, three old coal-ash dumps capped with soil and trees were underwater Thursday after the Neuse River flooded. Staff from the environmental group Waterkeeper Alliance visited the flooded dumps at the H.F. Lee Power Plant by boat Wednesday, took photographs and collected samples of gray sludge washing into the floodwaters. Meanwhile, South Carolina’s state-owned utility said floodwaters had also entered a coal ash dump at its closed Grainger plant near Conway. Santee Cooper spokeswoman Mollie Gore said no significant environmental impact is expected because nearly all the ash has been removed from the basin and water pumped in to prevent the dike from breaking. The company had placed a 2 ½-foot (72-centimeter) high inflatable berm around the top of a second pond that has more coal ash in it. She estimates 200,000 tons (181 million kilograms) of ash are in a corner of the pond furthest from the rising Waccamaw River. River forecasts project the Waccamaw will reach a new historic flood level this weekend, eclipsing a record height set by Hurricane Matthew in 2016.